For a condition unfamiliar to the average person, gastroparesis (pronounced GAS-trow-puh-REE-sis) is a big deal. It completely takes over the lives of those who suffer from it and often sends them running to the emergency room. "I think of it as being deep underwater trying to swim up," says gastroparesis 'veteran' Stephanie Hyatt in The Gastroparesis Cookbook by Karen Frazier. "When I'm feeling good, I am getting close to the surface. But then, I end up being pushed back down. It's a constant physical struggle." Gastroparesis is a disorder of gastric motility -- that is, the stomach has difficulty emptying itself of food. It occurs when there is abnormal function of muscles and nerves (especially the vagus nerve) or of the 'pacemaker' cells in the stomach wall that lead to stomach muscle contraction. Those with gastroparesis may feel full after eating only a few bites of food; symptoms that can flare up unexpectedly include nausea, gastro-esophageal reflux, vomiting, bloating, and abdominal pain. Nutrient deficiencies and weight loss are common. Most often, gastroparesis occurs in diabetes or after a surgery or viral infection, but other times there is no known cause. Doctors fully admit their tools for treating gastroparesis are limited. Medications can prove to be useful: metoclopramide, and sometimes . domperidone, are prescribed. While some new treatment approaches are also being studied, dietary change is one of the primary ways to manage the disorder. Scientists have found that different kinds of meals empty from the stomach at different rates, depending on their consistency, fat content, and total number of calories. Generally, foods that provoke symptoms in gastroparesis tend to be fatty, acidic, spicy, or high in fiber. Tolerated foods are highly individual, but those with gastroparesis usually report more success with bland and soft foods like pasta, broth, or custard. Those who suffer from gastroparesis say it can be difficult to watch other people eat when they cannot. 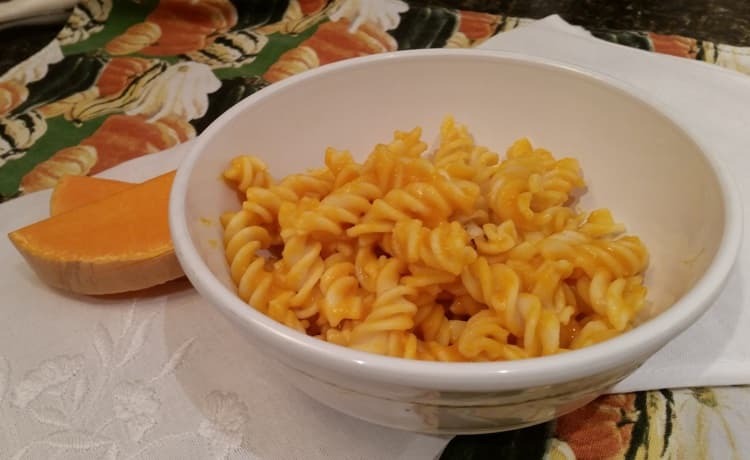 This recipe, a twist on traditional macaroni and cheese, is designed not only to be tolerated by those with gastroparesis, but also to appeal to those around the table who don't have the disease. The classic version uses elbow macaroni, but other shapes of pasta work just as well. If you bake the butternut squash in advance, you can make this kid-friendly, stomach-friendly meal in less than ten minutes. Cut butternut squash in half and place it face-down on a parchment-covered cookie sheet. Bake at 350 degrees F for approximately 1 hour, or until flesh is tender. Scoop out and discard the seeds, then separate the cooked flesh from the skin and set aside the orange flesh in a bowl. Add coconut milk, garlic, and salt to a small saucepan over medium heat. Bring mixture to a simmer, whisking occasionally. Continue simmering for 2 minutes, then remove from heat and cool slightly. Mix cooked pasta with squash puree. Serve immediately. For a baked version, place squash-coated pasta in a roasting dish and sprinkle with optional low-fat cheese. Bake for 15 minutes at 350 degrees F to heat through, and then broil for 5 more minutes until cheese is golden.